In most cases the reason for the rating given a particular item will be obvious based on our normal evaluation criteria which can be found by clicking on the Group Heading link and reading the relevant text regarding that item. In cases where a low rating is not obvious, for example, if an otherwise good product is damaged due to poor packing, the reason will be given in the listing. Further explanation and the overall rating of both quality and value for the Survival Kit will be found in the written evaluation which follows the kit contents listing. Click on photo to view higher resolution photo. George VanOrden is a veteran of 21 years service in the Marine Corps. His Pro Survival Kit Company produces a line of personal survival kits based on those George originally developed for his own use, based on his experiences in teaching survival in the military. The Pocket Pro Survival Kit is a personal size kit in a black plastic waterproof case that hinges at the side and has a single over-center latch. Overall exterior dimensions are about the size of the traditional tobacco tin kit, as used by BCB and Penrith, but the thicker plastic, hinge, and latch give up quite a bit on the interior dimensions. On the plus side, access is easy and it is inherently waterproof with an rubber seal, no tape to mess with. It weighs in at 6.6 ounces, light enough not to be too noticeable. 2.2 ounces of that is the "capsule." The latch is easily opened; almost too easily. We caught it on something at one point and it opened the latch accidentally, though the lid itself didn't come completely open since we caught it. Our simple improvised solution was a rubber band, and after a discussion about this, George has sent us a black elastic band that is now included for this purpose and which works fine. Commercial grade vacuum packaging is used to make compact modules to maximize storage in the slim container. (view kit unpacked layer by layer) Needing a way to open these packages (and acting as if the kit is our last resource), we had difficulty opening the one containing the knife and resorted to using our teeth to rip it open. While we suspect nobody carrying such a kit is likely to be without a knife in the first place (a philosophical touchstone when assembling such kits, include a knife or not? ), given the vacuum packaging and the knife's inclusion, it might perhaps be better to leave the knife out of the vacuum packed items for ready access and after we discussed this, George has decided to do exactly that -- problem, such as it was, solved. Aside from lack of a locking blade, the Victorinox Whistle Swiss Army Knife is good quality, if not very robust. The whistle incorporated into the scale on one side is better than nothing, though not nearly as loud as a quality SOLAS grade whistle, approximately half as loud when we compared subjectively over a distance of 150 yards (183 m). By the same token, for the pack volume a normal whistle would occupy, you gain a knife, scissors and a so-so file, not the worst tradeoff. A wrist lanyard of nylon string has been added. George makes up his own signal mirror, a very compact 1 x 2 inches and only as thick as a penny. The mirror in the kits we received had a hole drilled in the center for aiming purposes, but since it still would not allow one-handed aiming, George later eliminated the hole, adding 2.5% to the reflective surface for improved performance. Given the small size of this mirror, every little bit helps. Aiming instructions, including an illustration, are provided in the survival instructions. A flexible black plastic sheet cover protects the mirrored surface, held in place by static cling. As long as care is taken where you put it after removing it (we found we could stick it to the back side of the mirror) the protective cover can be replaced for continued protection of the mirror surface. A wrist lanyard of nylon string help keep the light, small and easily dropped/blown-away mirror secure. Firestarting is provided for with the excellent one-handed Spark-Lite flint firestarter, five BCB NATO Wind and Waterproof matches and the Spark-Lite waterproof tinder. George has drilled the Spark-Lite to allow him to attach a nylon string wrist lanyard. The length of tape is wrapped around the Spark-Lite. For a compass, George has taken the quality made-in-Sweden Brunton (Silva everywhere but North America) 40LU watchband compass and sliced off the watchband loop and added a lanyard. There are six two-foot lengths of stainless steel snare wire. They are cut because the wire is too tough to cut without a wire cutter. This makes it easier, or more correct, possible to make up small snares, but restricts a little the ultimate potential of the wire for other purposes. For packaging considerations, the bulky split rings normally attached to the ends of the wire saw have been replaced with loops of parachute cord, which seem to work just fine. In fact, they were more comfortable, though not as easy to use when improvising a bow saw. When we mentioned that we'd prefer to see one or two more safety pins beyond the single one in the kit we received for evaluation, George immediately upgraded to three. The Flosscard provides a nice supply of waxed dental floss, good for a multitude of uses, in a very compact and slim package the size of a credit card. The Aquatabs are a chlorine based water disinfectant, and while generally considered not to be quite as effective when high organic contamination of water is an issue as is iodine, the strip packaging is their trump card and provided care is taken in their use, they are quite adequate for the most part. The Gerber "Seal 'n Go" bag is an excellent water container that much easier to use than the traditional condom. The assortment of fishing gear is of sufficient quantity and quality so as to make this a viable means of food procurement in the right environment and there's a waterproof illustrated card of fishing knots and such, copied right out of the mil-spec fishing kit. There is a good assortment of basic medical items to treat small injuries. The standard grade plastic adhesive bandages will do the job in most cases, but are not as abuse resistant or sticky as some. Expiration dates of the medical items and the Aquatabs are clearly listed on a tag in the package and on a separate list of contents. While some companies will send you a reminder about expiring medical items, Pro Survival raises the bar with an extraordinary offer of free replacement, all you have to do is send them a self-addressed, stamped envelope. The fresnel lens magnifier will not only serve as a back-up firestarter, it also makes it much easier to read the small print on the survival instructions. This Survival Instruction sheet is pretty good and when we mentioned a few items we had concerns with, such as the solar still illustrated in the original instructions included in the photo above, George got us on the phone and eliminated that and made some other minor but important changes as well. We like that this is printed on waterproof paper. Packed with the kit is an envelope with a contents list, including expiration dates for all life-limited items, a reminder to contact Pro Survival for your free replacement of dated medical items, a review of the contents with suggested uses for each piece of gear and all the manufacturers' instructions that came with each piece, a very nice and helpful touch. Also included is the 15 day, no questions, money-back refund offer if not satisfied. 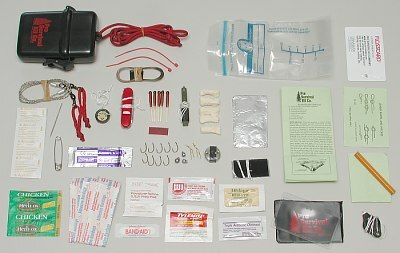 NOTE: Virtually this same kit, less a few items, is also available as the Belt Pro Survival Kit with the contents packed inside a belt. Overall, we rate this kit as "Very Good. "� We were very impressed by the attention to detail and high quality of almost everything in the kit. George's response to our queries to address items we wondered about shows that he is committed to making it a good as he can, within the constraints of commercial production. While there are some items that could stand small improvements, any such deficients, such as they are, are minimal for the most part and not life threatening. While not cheap, it represents an excellent value because it's all there. Slip it into your pocket and you are good to go. Not a lot more you can ask of a pre-assembled commercial survival kit. Disclosure: In the interest of full disclosure, it should be noted that George is an active participant on The Survival Forum on Equipped To Survive and has made a donation to the Equipped To Survive Foundation in support of this Web site.